For many people, knowing how to grow ginger may seem challenging, and as it's a tropical plant it can be quite difficult to get a decent crop. The plant itself is quite simple to grow, but to get a decent harvest of fresh ginger root can be slightly more difficult. Unless you live in the tropics, it's best to grow this plant in pots so you can bring indoors if it gets too cold. You really need constant minimum temperatures of 25-30°C. If you have a heated greenhouse you may get better results. But since it's pretty and can be used in so many wonderful ways, why not have a go? If it doesn't quite work out, the ginger plant is very attractive at least and makes a nice addition to the flowerbed. Read more about the plant itself. ... As it's a tropical plant it needs shelter from direct sunlight, warm weather, humidity and moist, rich soil. A greenhouse or conservatory are ideals places to grow the plant. 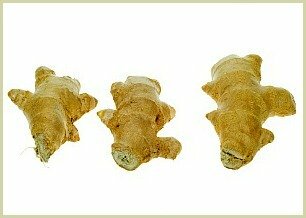 You can get started growing ginger by buying some store-bought root. Look for roots that look fresh and unwrinkled and look for growth buds, which look like little eyes sticking out of the root. Note: If this is a new plant then you can eat the young roots, or let it grow for another year and you'll get a tastier, more mature harvest. Click here to return to the main how to grow herbs page. Now you know how to grow ginger, you can have a healthy supply of this tasty, wonderful spice and get to appreciate the many uses all year long! You can of course use it fresh in your home cooking, or, one of my favourite ways of using the roots is to make a healthy drink with them. Click here for my fresh ginger tea recipe.